At the beginning of January, the metro-Detroit area experienced the deportation of a man that had been living here for 30 years. He was ripped from his wife and children and sent back to Mexico on Martin Luther King Jr. Day. Detroit has a large population of immigrants, specifically South West Detroit and Dearborn, MI. 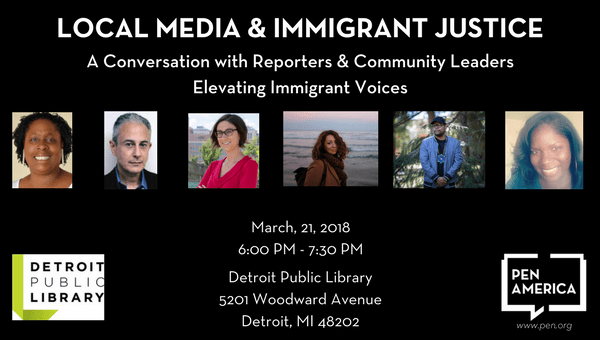 Reporters such as Niraj Warikoo have been covering many of these immigration stories for the Detroit Free Press. Without the work of local reporters, many members in the communities would not have access to this information, nor be empowered to make decisions on issues like these affecting the immigrant population. 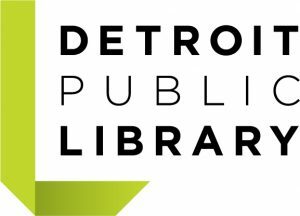 PEN America along with the Detroit Public Library, local reporters, and community leaders & activists discussed immigration concerns within the community at the Detroit Public Library. This event was open to the public and free for all ages. Panelists Liana Aghajanian, Sacramento Knoxx, Alicia Nails, Hayg Oshagan, Christine Sauvé, and moderator Amber Ogden shared their perspectives on immigration stories and concerns unique to Detroit and discussed why access to information and media discourse around immigration issues is important. Following the panel discussion, PEN America welcomed questions from members of the community in an engaging Q&A format that allowed them to share stories, concerns, and learn more about what they can do and what resources are available to the community. Liana Aghajanian was raised in Los Angeles by way of Tehran after coming to the United States as a refugee. Aghajanian is a journalist specializing in longform, narrative storytelling and international reporting. She is a 2017 Images & Voices of Hope Restorative Narrative Fellow, undertaking a project on the intersection of Native American sovereignty and science. She is also the 2015 winner of the Write A House residency, a program for writers in Detroit. Her reporting has appeared in The New York Times, The Guardian, BBC, Foreign Policy, Newsweek, Al Jazeera America, and other publications. Sacramento Knoxx, a hardworking interdisciplinary artist with strong Detroit roots, has built community concerts and workshops that engage many audiences in public spaces all around the city. Currently he travels nationally and internationally sharing interactive music performances, blending captured moments in life and creative imagery through large projection motion graphics. Building from raw experience and grit, his works send vibrations to help assemble the worlds we want to live in. In addition to creating these dynamic storytelling installations, he creates documentary film and music videos encapsulating the experience of struggle and celebration of diverse layers of communities. Alicia Nails is an Emmy Award-winning television journalist and the director of Wayne State University’s Journalism Institute for Media Diversity where she also teaches Reporting on Race, Gender, and Culture. Her writing has appeared in the Detroit Free Press, The Detroit News, the Michigan Chronicle, and BLAC magazine, where she serves on the advisory board. Her prior experience includes working as a writer/producer at WWJ NewsRadio 950 (CBS), Detroit’s only all-news station, where she also wrote and delivered feature reports. She is also a board member of the Detroit Chapter of the National Association of Black Journalists and the Rosa Parks Scholarship Foundation. Moderator Amber Ogden is a Detroit native and experienced writer with an extensive background in communications, marketing, and events. She has previously worked in the social work field as a foster care worker, licensing specialist, development, and in residential facilities. With her passion for at-risk youth and families, she is currently developing marketing and fundraising efforts for non-profit organizations. She is also a freelance writer. Her work has appeared in Black Bride magazine, LOCALE Magazine, The Event Bar, and BASIC Magazine. She was recently recognized as a freelance writer in Metromode alongside other experienced writers, journalists, and photographers. Hayg Oshagan is an associate professor in the Department of Communication at Wayne State University. His research is on the effects of mass media and the role of ethnic media in ethnic communities. He is a frequent public speaker and is nationally recognized for his efforts with ethnic media. Oshagan is the founder and director of New Michigan Media, a network of ethnic and minority media across the state of Michigan. He serves on immigration-related commissions appointed by the Michigan governor and Detroit City Council. 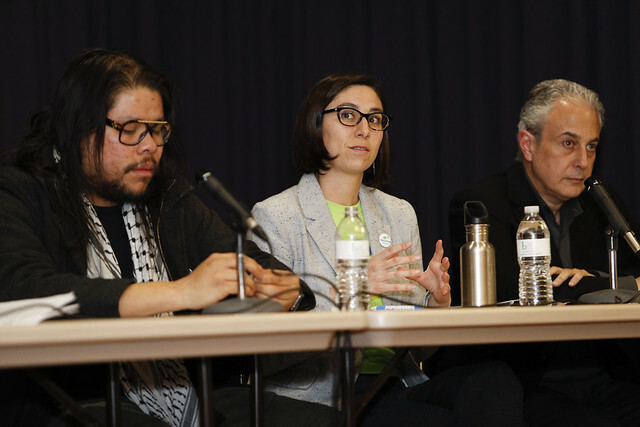 Christine Sauvé leads the Welcoming Michigan project, a statewide grassroots immigrant integration initiative of the Michigan Immigrant Rights Center. Sauvé is a multicultural community organizer dedicated to creating social change in metro Detroit. In 2012 she received a Diversity Distinction Award from the City of Sterling Heights. In 2013 she was one of ten national leaders honored by The White House as a Champion for Change for helping immigrants integrate civically, linguistically, and socially into the fabric of their neighborhoods and the nation.